Three more teams (Nizhny Novgorod, Le Mans and Nanterre) secured their spot in the knockout stage of the Basketball Champions League. 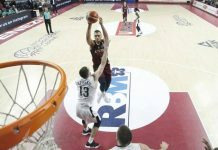 Nizhny Novgorod cruised to an easy victory over Ludwigsburg on the road (59-85), with Vladimir Dragicevic leading the winners with 24 points (on 10/16 shooting) and Artem Komolov adding 17. For their part, Le Mans went to a 12-3 run in overtime and defeated Anwil (88-79) to reach the knockout stage. Valentin Bigote had 23 points, six rebounds and four assists for the winners, with Antoine Eito posting 15 points, seven boards and six assists and Michael Thompson contributing 14 points and six assists. Nanterre rallied past UNET Holon on the road (62-74) and secured its place in the playoffs. Julian Gamble had 15 points and nine rebounds for the winners, as Dominic Waters scored 14 points and dished seven assists and Lahaou Konate posted 12 points and nine boards.